Ephedrine is a stimulant drug derived from the plant Ephedra. It has been a feature of Chinese medicine since the Han dynasty (206 BC – 220 AD) as an anti-asthmatic and stimulant. Ephedrine has been used as an aid to weight loss and is found in some over-the-counter medicines such as Sudafed, where it works as a decongestant and for the temporary relief of shortness of breath, chest tightness, and wheezing. 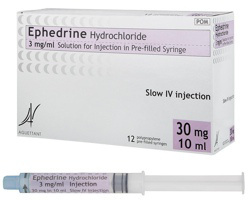 Ephedrine is similar in chemical structure to methamphetamine and the neurotransmitter epinephrine (adrenaline). It can, in fact, be used to make the stimulant methamphetamine. It is also sometimes found in tablets sold as ecstasy or herbal ecstasy. Error: Error validating access token: Session has expired on Saturday, 03-Nov-18 03:39:19 PDT. The current time is Friday, 19-Apr-19 14:15:44 PDT.